For over 40 years, The Law Firm of Hauer & Snover has represented both men and women throughout Michigan in matters that include divorce, child and spousal support, child custody and parenting time. We also counsel clients regarding the preparation, negotiation and enforcement of prenuptial and postnuptial agreements, as well as property distributions, business and asset valuations, and division of employee and pension benefits associated with marital dissolution. Regardless of the setting or issue, our attorneys bring their superior skill, compassion, understanding, and a deep knowledge of the law to achieve the best possible outcome for our clients. Although we acknowledge that many family law matters can be resolved through mediation or other alternative dispute resolution methods, we also know that appearing in court is often the only way to achieve our clients’ goals. We will do what it takes to get you the results that you deserve. 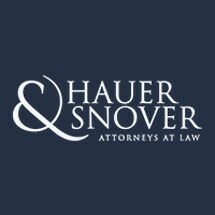 The Law Firm of Hauer & Snover was named by US News & World Report as a Best Law Firm in Family Law. Our attorneys have been recognized as Michigan Super Lawyers and Best Lawyers in America, they have been selected as Leading Lawyers in Family Law and named to D Business Top Lawyers. If you are looking for a team that has a proven reputation that you can trust, contact one of our attorneys.